As a content marketer, the main reason to start outsourcing content is to free up time in your schedule, so you can take care of more important things. Rather than researching and writing, your time is better spent working on conversions, SEO, or something that's harder to hand off to another party. Content, considering that just about everyone can write, is pretty easy to start buying and publishing on your site. But it's easy to get caught up in the dangerous (i.e. expensive) cycle of paying for content that doesn't do anything for you business. I've spent tens of thousands of dollars over the years in content that didn't rank, let alone convert into sales. Outsourcing content is easy. You can find people write trash for $20 per 1000 words and publish it. Outsourcing profitable content is where the challenge lies. Without the profitability factor, buying articles for your website doesn't make running your business easier – it just makes it more expensive. So in this series of articles I'm trying a bunch of content writing services and rating them based on whether or not they make running my business easier. Are they worth the price? Do they rank? Do they convert? These are the questions I hope to answer. Today's featured writing service is Content Refined. While researching writing services this one turned up from Jon Haver, owner of Authority Website Income. He's a well-known dude in the “niche website” space, and has built a trusted brand. I think I read about it on Fat Stacks Blog, and what convinced me is to try Content Refined before any other service is that Jon Dykstra (yeah, another Jon) mentioned it was a “blog management” service. Pricing: Is It A Good Price For What You Get? SEO Optimization: What Did They Do? Should You Use Content Refined For Your Blog? I'm obsessed with the idea of creating individually profitable websites that grow on their own. I have a project I'm working on that's making money with display ads and it's finally making some decent money (about $1000 per month). 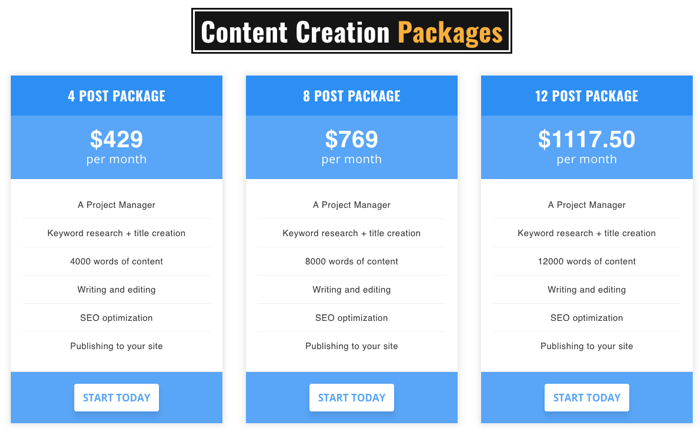 The idea I'm really trying to push is that I want to outsource enough content to grow the blog, but at the same time have it cost me less than what it's earning (at this time, $1000 per month). As it stands, for this particular website, I'm doing a lot of “busy work”. I'm writing, managing writers, editing, and doing other tasks which are making this blog a second full time job (after this website). My goal is to make the website basically be hands-off in terms of income. Except for the occasional “fun” post, I don't want to do any writing or editing, and very little writer management. So that's the goal, and since Content Refined offered keyword research, article writing, uploading, and formatting the post, I was pretty excited to sign up. I was really hoping that they'd live up to their slogan as an “end to end content marketing solution”. This is the package I got (8 post package). I ordered keyword research separately: 6 months x 8 keywords = 48 keywords for $442. I was pretty confident I wanted to stay with Content Refined for six months. My first communication with the staff at Content Refined was on 11/15/17. I didn't receive a published article until 2/9/18. That's almost three months of back and forth communication before actually getting a piece of content on my website. This is in comparison to hiring on UpWork.com, where I can get an article published next day if I give the right job to the right person. That timeline doesn't tell the full story – there was a lot that happened over those three months, not all of which was their fault. I had some initial questions to ask, which took a week or two. However, there were at least two instance where the manager there didn't respond for more than a week. For example, I received no communication from Dec 8 to Jan 2. I ordered my first article package on Jan 9, 2018, so received the first delivery on Feb 9. At this point, I was a little frustrated that getting started took so long, but that's the way things go sometimes when starting with new writers, so I was still on board and ready to get my awesome content! Spoiler alert – I wasn't very happy with the content I received. I'll dig into more details below, but the style of content delivered was very basic, content farm style content. It was very obviously not written by an “expert”, or anyone that had done in-depth research. The price I paid for this was $73.66/month for 8 keywords ($442 for 6 months of 8 per month), plus $609/month for the article, uploading, and formatting. Doing my own keyword research, I was able to get a 1,000 word article for .04 per word on Fiverr, and the content quality was similar. That did not include uploading, images, or “SEO” (more on that later). For Word Agents, before our spat, I paid .08 per word, and that did not include uploading. In terms of comparing services, from what I've tried so far, the pricing of Content Refined is on par with competitors. That doesn't mean it's a good price though. It's very possible to get enthusiastic, knowledgable, native (or fluent) writers on UpWork for .02-.05 per word, including uploading to WordPress. I'm not going to get into who writes what and how much they get paid, but in terms of price, I had high expectations for paying 8-9 cents per word for content. Unfortunately, those expectations were not met. Remember, my goal for using a content outsourcing service was to remove myself from the website, and have it grow at a pace that income would outpace expenses. The website I was hiring for is making about $1500 per month. Content Refined costing $700 per month for 8 articles was in line with the cost vs profit goal. However, the level of content that was delivered, would not, in my opinion, grow the website in any significant way. In other words, I'd just be dumping 1/2 of my profits into the site and praying for the odd ranking. In summary, it's a fair price based on what other content farms are charging, but it's not a price that I would pay. Keyword research can be very tough. There are many different keyword research tools out there, each with their own set of metrics. Personally, I use Jaaxy most frequently, but wrote a very positive review of Mangools. I also love SEMRush, although they do something a bit different, and keyword research is a kind of secondary bonus to what they offer. Personally, I think that “niche experts” get too caught up in various metrics trying to find the perfect storm of easy-to-rank, high traffic keywords. I will freely admit that my own keyword research techniques are far from perfect. Sometimes, it feels like throwing spaghetti at the wall, so I was totally open to see what Content Refined could produce. Please! Show me how it's done guys! My excitement dwindled after I received a bunch of keywords with numbers attached to them that didn't mean much. I assume they meant that they were low competition. The only metric I understood on this page (aside from search volume) was approximate CPC. As you can see, the CPC they delivered was very, very low. So much so, the lowest one on the page was $0.10. Low CPC usually comes with the territory for long tail, low competition keywords, but I was hoping for something a bit more lucrative. Since my site is mostly monetized with Adsense, and I didn't have any specific affiliate reviews I wanted done, a higher CPC would have been ideal. I originally discussed this with the business manager at Content Refined, but failed to follow up and emphasize this with the keyword research time. To be fair, I did approve of these keywords, so I'm not saying they did anything wrong here, but I guess a little more direction would have been nice as part of the keyword research process. I joined this service to make my job easier, and so far, it wasn't working out that way. There's literally thousands of possibilities of keywords out there, and these are the ones they chose? Yes, it gets some searches. Yes, it's low competition. But it's not really a profitable phrase to shoot for in my opinion, and an article titled “Where to find office depot notepads” just isn't going to do much to grow a website even if it fits all the metrics. That's how I felt about a lot of these keywords and titles. That being said, some of the keywords and titles were really good! Some of them had a high CPC as well, and showed real potential. It was just hard to stomach the cost of over $70 per month for just 8 keywords when the majority of them were bleh. So let's dig into the content review. As mentioned above, I wasn't happy with the results, at least for the price I paid. My website is not a major authority in the space, but it's over 3 years old, and has #1 rankings for plenty of low competition keywords. From 8 articles published, for which I did minimal editing, I got only two page 1 rankings after three weeks, one of which is actually competitive. So as it stands, $700 later, my site has not grown this month as a result of outsourcing content. That is a fact. But was the problem my website? Was it an issue of authority? Website SEO? Backlink profile? These could all be contributing factors to why these particular articles did not rank. Again, to be fair, Content Refined doesn't guarantee that you'll rank, get traffic, or make money. However, in my opinion, the core source of the lack of ranking was twofold. One, poor choice of keywords. Two, low quality content. The content delivered met all the specifications outlined on their home page. It was grammatically correct. It was 1000 words. It was based on low-comp keywords. It was (somewhat) optimized for search. They delivered on all that stuff. That being said, it was still low quality. Reading over it, it's painfully obvious that this content was outsourced. Anyone that knows about the topic they wrote about could tell it was researched in an afternoon, and written to fill a word count. It was not inspiring or interesting. 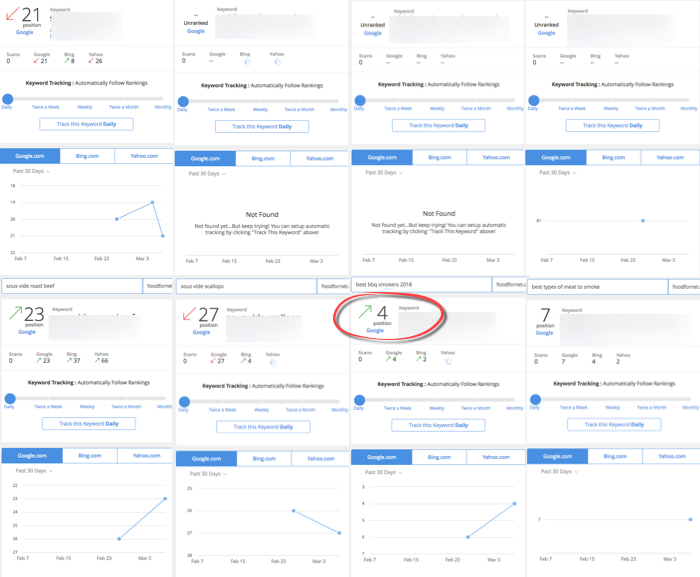 I've spent tens of thousands of dollars publishing content just because it fulfilled some SEO metrics I was shooting for, and years later, it still doesn't rank or convert. It just sits behind page 3 of Google, indexed for the target keyword, but not even close to page 1. I just don't envision the content written over the past two months producing anything exciting, whether that be likes, clicks, pageviews, or rank, let alone income. There are some positive things about the content service that are worth mentioning! For one, they upload the articles as part of the package, instead of charging more. That's easily something they could charge for. That upload process, includes some customization options. For example, you have them upload the content through the Thrive Architect Editor, and even include links from EasyAzon, which makes linking out to Amazon products with your affiliate link easy. Honestly, I'm not really sure what they did in terms of search engine optimization other than targeting low competition keywords. Some articles didn't even contain the main keyword in the body of the article. “Optimization” was inconsistent. The main images contained the article title as the image file name and alt tag. However, some articles didn't contain a main image. Some subsequent images had LSI keywords or related phrases, while others were just descriptive. Htags were inconsistent as well, and there didn't seem to be any method to things like bulleted lists, bold/italics, or any type of template strategy. I guess you could say they avoided over-optimization, but I didn't really get what their SEO goal was with these posts they wrote. The most frustrating thing was their method of creating internal/outbound links. It was completely random and unrelated. The writer literally, picked random blog posts and created internal links. I would have a post titled (just an example) “Best Large Dog Beds 2018”, and he'd create an internal link using the anchor text “dog beds”, and link to an internal post about cats. One specific example that annoyed me, was that he created a hyperlink for “lukewarm water” linked to the Wikipedia article, as if that link is useful, or even relevant to the article. Another (maybe nitpicky) examples is that they meta description they wrote was 210 characters long, and did not contain the main keyword. Also, alt tags are not just for keyword stuffing, though that seemed to be my writer's goal. They are for visually impaired readers and so search engines can understand what images are about. I got the impression that their SEO methods don't have a lot of real world results behind them. I understand that different people have different ideas of what's good or bad for SEO, but from what I could see, there was really no concrete method being implemented. Unrelated to search engine optimization, but related to communication optimization, there's some serious work to be done with Content Refined. Firstly, you do not have direct communication with the writers, so any “corrections” has to be done through your project manager. This delays any edits by 2-3 days at least. Secondly, there's no billing login area. I wanted to change my email, but had to go through the project manager, who then contacted the business manager. Then I wanted to change my billing date, and had to go through the same process. When I was accidentally re-billed after cancelling? Same deal. It was frustrating not being able to just manage my own account. In my opinion Content Refined did not live up to their tagline of being an “end to end content marketing solution”. I spent $1500+ dollars on their service, and I feel like I could have put that money to work much more efficiently somewhere else. Yes, I could have stuck it out longer and trained the writers to do more of what I expected. Yes, I could have been clearer in my instructions and waited out until proper corrections were made. In fact, I probably could have talked more with my project manager about specific types of keywords I was looking for, and spent time to disapprove the ones I didn't like. In other words, I could have done a bunch of other things to make the service work for me. But what's the point of doing that, and paying a middle-man in the meantime? I can take on that type of work load and hire people directly through freelancer websites. I'll end up paying less, have direct communication with my writers, get faster turnaround for all elements of the publishing process, and have content more in tune to my expectations. Honestly, I was a little embarrassed to publish the articles I received from Content Refined to my website. They are pretty obviously outsourced, and anyone who's interested in reading about my niche will immediately identify them as not being written by an authority, or even enthusiast in the space. It was publishing for the sake of publishing, and I've spent too much money in the past doing that. I already know the results it brings. Should you use Content Refined? Even though I wrote a lot of negative things about their service in this review, I think I was just disappointed that they didn't deliver what I had hoped for. They can fill a role for some types of content marketers out there. Here's the criteria you should meet to benefit from CR. I just don't want to see you guys dump thousands of dollars into a content strategy that doesn't produce results. I haven't seen results so far, and don't plan to in the future. I'll update if anything unique happens. I'm super curious to find out how other content delivery writing compare to these guys. Leave a comment with your favorite service, and I'll add them to my list of stuff to review. So who do I recommend for outsourcing? Pretty simple. Based on my experiences, for more personalized, multi-faceted content needs, UpWork.com (link to website) is the way to go. It takes more prep and organization on your part, but works out best in the long term. For cookie-cutter, template-style projects, you can't beat Textbroker (link to my review). Clocking in at less that three cents per word for excellent quality content. You'll have to do more research and editing work, e.g. keyword research, uploading to WordPress, formatting, and adding images but at least the quality will be good enough that completing these tasks will be all you'll have to do. Have you used Content Refined before? What are your thoughts on their service? Excellent post and comments, too! Thanks for this honest info and letting us know how it really turned out. I heard the company (CR) mentioned as an option by a very well known affiliate marketer but I’ll skip it and avoid getting burned. Back to try again on Upwork I go. Yeah, I tried about 5-6 different services, but still find Upwork more efficient for GREAT content (not farmed stuff). Sounds like your’e pretty familiar with the hiring process at UpWork, but you can check out my beginner training here (free). I just found this review article on Content Refined and thought I’d share my experience as well. Maybe it will help prevent someone from making a costly mistake. A little context-I’ve been building niche sites since 2010 (dozens of them) and have built one successful authority site as well that provides a full-time income. Back in January 2018, I had an idea for a new site but just didn’t have any more bandwidth to write the content. I’ve hired tons of folks on Upwork, Fiverr and other freelancer type sites over the years for all sorts of work-content writing, design, coding, etc. I found Content Refined as I was looking for an service that could help me seed the content for the new site. After a little back and forth with their manager, I decided to move forward. I provided them with the keywords and titles for each article along with the required length for each–30 articles altogether for a few bucks shy of $4,000. They delivered the articles as promised and mostly on time. However, my experience with the quality of content is right in line with your experience. Some of the articles were just okay and some of them were terrible, very low quality. Now, I didn’t panic, I expected that there would be some that would need a little polish. But the amount of work the content needed was hard to believe for the premium price that I paid. In all fairness, they relented and made some corrections though most were minor improvements and even the rewrites were less than great. After that, I gave up as I just couldn’t spend any more time with them. Through all of it, I never once received any acknowledgement that any of the content was sub-par. I paid more to an editor I hired to fix a lot of it and hired my own writer to rewrite much of it. In the end, it cost me more than $4500. I now have a writer that I hired through Upwork who does a great job, is a subject matter expert in my site’s niche and charges me less than .05/word. My lesson learned (again): paying more doesn’t always mean you’ll get more. I tried about 5 services so far (taking a hiatus from this project for a bit), and have found the same. Unless you personally vet and work with writers, it’s very hard to get quality content. Adding a middle man for outsourcing just increases price and decreases communication and service aspects. Thank you for taking the time to share your experience here BW! Hey Nathaniell – quick sidenote first. I happened to have made a note to myself to come back and check the comments here but I couldn’t find a way to subscribe? Otherwise I would not have seen this. I guess it’s hit or miss if they feel like uploading the content or not. I didn’t mind having a project manager, she was helpful and enthusiastic – but there’s just no way around paying for three articles where the products cost MORE than $200 for a keyword of “best Product X under $200) and them not rewriting their articles. Again, Content Refined Review – do NOT use them. That would be frustrating!~ They claim to have “SEO Optimized Content” but missed something as obvious as naming images what they are instead of photo-xyz. If you are going to offer an end-to-end content solution for ranking and making money, then do it right. You are correct. Why pay the huge fee when you could get the same headache of needing to edit articles for a fraction of the price. If it really was “done for you”, then OK, charge whatever you want as long as it ranks and converts. But if it’s content that needs tight supervision, well, I don’t see what makes them a unique service in this landscape. Nathaniell – Content Refined is a DISASTER! No one should use them. I started with them in January – and they delivered great articles for one of my sites. Then, the second month, the articles were garbage in terms of SEO and just plain wrong. For example, the assignment was write an article for keyword “Best Product-X Under $200” and to choose three products to review for said article. Making a total of 4 articles. All three of the products they chose cost OVER $200 and they will not rewrite the articles nor refund the money. On top of the articles just being WRONG, they refused to upload them to WP (I was told I misunderstood how they work), none of the articles included the keyword in the first paragraph, and they don’t pass even the most basic of SEO criteria. Not rewriting articles seems to be a running theme for these “boutique” services that manage content writers. Though I haven’t finished writing the reviews yet, I’ve had a much better experience with Textbroker and iWriter (they also have their pros/cons!). Either way, not having direct communication with the writers is a serious downside for ANY content service. They do it to prevent clients for “stealing” writers. However, my experience was different with Content Refined. When a writer uploaded copyrighted images and I told my project manager, they had the writer re-upload new images. I can definitely see a market for what Content Refined claims to offer. However, based on your experience, they seem to have positioned themselves as a middleman that doesn’t need to be in the middle. “Hire our secret staff of awesome writers” but don’t talk to them. Talk to us, and we’ll talk to them. I’m curious why they would not upload the articles for you. They did it for me as part of my package. Perhaps they changed what services they offer?